Royal Caribbean acquired Spanish tour operator Pullmantur and their ships a year ago, but for some reason the English-speaking Cuban press seems to just be discovering it and its effects on the island nation. In the last week, we've seen a couple of articles on the subject running in the Cuban press. The one appearing in Gramma yesterday is the more thorough. US law prohibits US-owned companies from doing business with Cuba. The immediate effect of the acquisition was that Cuban crew members aboard the Pullmantur ships had to be terminated and sent home. Longer term, it also means, of course, that Pullmantur's ships will no longer be calling at Cuban ports. There was a similar economic loss to the island when Carnival Corp acquired Costa Crociere. Cruise News Daily has reported several times over the last few years on the potential Cuba has had both as a port of call and a port of embarkation in combination with European-sourced charter flights. In addition to the direct loss of calls and jobs caused by the US embargo, another provision of the embargo that also stifles Cuba's cruise industry is one that prohibits calls at any US port (including San Juan and St. Thomas) by any ship which has called at a Cuban port within the previous six months. Carnival Corp ordered two new ships for its Costa brand this morning. The 114,200-ton ships will be built by Fincantieri and will be sisters to Costa Concordia, Costa Serena and Costa Pacifica. They will be delivered in 2011 and 2012. Just when you think I've stopped blogging, I'm back. 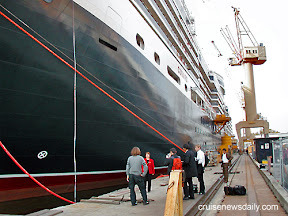 Over the weekend I went to the Fincantieri yard near Venice to see the progress of the fitting out of Cunard's Queen Victoria. The trip was so short, and time was so compressed, there was just no time to blog. When I returned to the office on Monday, there was a rather lengthy CND article about QV to finish up and photos to select for subscribers to see. Along on the trip was Cunard CEO Carol Marlow. As we'd walk along in the ship, she'd be commenting almost nonstop on the details/features. She knows the ship inside and out. But one of the things I noticed was that several times as we'd come to major features of the ship (or outside the ship as shown here), she'd just stop, knowing the photographers wanted pictures of her in front of whatever. Then she'd patiently pose while they would take dozens and dozens of photos each. Sometimes she'd even suggest turning so they get this or that, and then there'd be one who'd want to get closer. There was no attitude of "I'm too important for this," or "Let's get this over with." Then it struck me what a unique position she's in. If the media wants to take photos of most CEO's, they just take a few snaps of them in some corporate surrounding. Very few CEO's, on the other hand, routinely get asked to pose with their product to promote it. Consequently, she has a relatively unique opportunity to publicize her product from this angle and that. Cruise Line CEO's, maybe airline presidents, and a few others have this opportunity. But how often do you think the CEO of Anheuser Busch gets asked to pose with a bottle of Budweiser or the CEO of Kimberly Clark gets asked to pose with a box of Depends or a package of Cottonelle? Carol's lucky, and I think she appreciates it.